We have observed that for our customers who receive heavy email-to-case traffic, it becomes very difficult to find / locate any case related attachments (whether in email or in notes). Consider a scenario, when a support agent is on phone with customer and there is a mention of a file which was sent earlier by the customer. Now, in order to find this file (attachment), the support agent would need to scroll through all the case related email activities…then open each of the email activity record…browse to the attachments section…open the attachment…download it and then finally get to view it…This is an incredibly time-consuming process. Zap Helpdesk App has an “Attachment Viewer” functionality that can help in quickly searching all case related attachments. 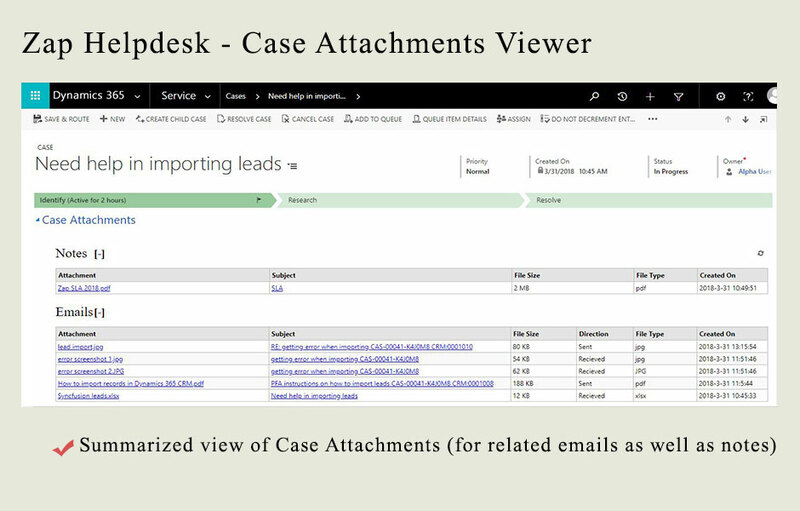 When you import Zap Helpdesk App solution file, an “Attachment Viewer” section gets automatically added to the Case form automatically (as shown in below screenshot). Case Attachment viewer can eliminate all the unnecessary clicks when finding attachments in Case, making your support agents more productive. If you are using a custom Case form then you will need to manually add the attachment viewer section. All attachments in related notes as well as emails are shown in Attachment Viewer section. If you would like to filter the attachments by file-size or by file-type then create “Attachment Viewer Settings” (Browse to Zap Apps >> Zap Helpdesk >> Attachment Viewer Settings).